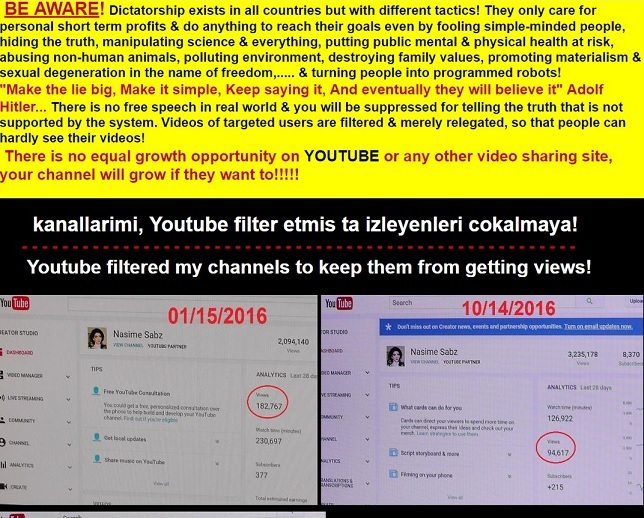 Nasim Aghdam, 39, of Southern California, wounded three people at YouTube headquarters, before killing herself,on Tuesday, "angry" at them according to her father and brother, due to their censorship and demonetizing practices, as seen in her "manifesto" screed against them, her online postings, as well as her video explaining those practices. It is quite obvious what her motive was, yet multiple reports state that authorities are still trying to determine her motive. 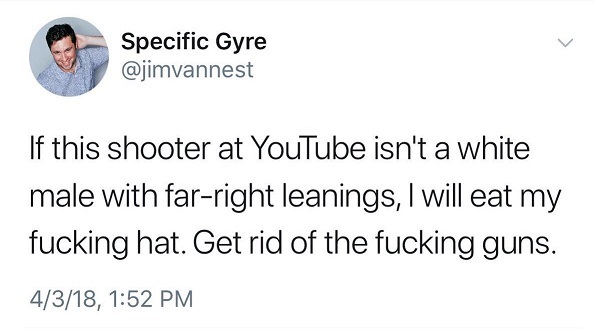 While most normal people were researching and reading everything possible to find out who opened fire at YouTube and why, others, specifically liberal gun grabbers hell-bent on creating a narrative regardless of whether it was true or not, in conjunction with media speculation, and the rabble-rousers over at 4chan, turned Twitter into a cornucopia of misinformation, that quickly spread across the internet. Unfortunately, Mr. Sleve McDichael, who owns that account has his tweets protected so only confirmed followers have access to @jimvannest's Tweets and complete profile, so it isn't possible to ask him for video proof that he isn't a big fat liar and really ate his hat. Others instantly politicizing the shooting, before any details had emerged include comedian wannabe and former NFL free agent, Michael Ian Black, who decided his first reaction should be " Another shooting. I'm going to politicize the f*ck out of it, and so should you. The NRA is a terrorist organization," and when confronted by other users asking him some common sense questions, like "Do you know who the shooter is? Do you know if they're an NRA member? Do you know how they got the gun? You're pinning this on your preferred target without any evidence," his brilliant (NOT) response was "No, I don't know who the shooter is. It doesn't matter if they are an NRA member. Yes, I know how they got the gun: the NRA and its blood-soaked lackeys made it possible for that person to get it." His craziness continued on as people attempted to explain the facts to him, such as the NRA has nothing to do with the criminal use of firearms, and highlighting how unhinged he sounded, one specific response of his shows us the bottom line goal of every gun-grabber, when he states "Andrew, you misunderstand. I *am* coming for your guns. I want to repeal the Second Amendment. That doesn't mean I am advocating a total gun ban, but I do want to make gun ownership much more difficult and onerous. I have made this abundantly clear time and time again." See the entire thread at Twitchy, highlighting how "unhinged" gun-grabbers truly are. As I pointed out to Mr. Black, after telling him he needs meds, is that "NRA is made up of millions of Americans. Period. That is not a terrorist organization. It is that type of hyperbole and outright lies, that has brought half mil new members & donation spike to the NRA. Good going." My response is backed up with factual data. In January, according to the Center for Responsive Politics, the NRA reported $247,985 in donations, and after the Soros orchestrated attacks on the NRA after the Valentines Day Massacre in Parkland, Florida, those donations tripled to a total of $779,063 in February, while seeing a 500,000 increase in news memberships. Another prominent gun grabber, Shannon Watts, also decided to attack the NRA for a previous comment telling NRA members they need to "rise up in the face of censorship," after Google's YouTube decided to ban content related to the sale or assembly of firearms or firearms accessories. Watt's tweeted "In light of the shooting in San Bruno at YouTube, will the @NRA apologize for this disgusting tweet in which it calls on its members to 'rise up' against the company’s decision to take down how-to gun videos?" Ms. Watt's and her followers seem to think that was some type of incitement to go shoot people at YouTube or something, despite the reminder by others, with screen shots, showing that she herself has called upon people to "rise up." But in a liberal's mind, when they say "rise up," it is a reference to activism, but when the NRA or a conservative does the same, it is some type of call for violence. Those are just a couple of examples out of hundreds where liberal gun-grabbers instantly started attacking the NRA on Tuesday, which for the record, has never been connected to any mass shooting, never sold a weapons to any mass shooter, and has never attempted to incite violence, despite gun control proponents actively calling for the death of NRA members, and their children, on a daily basis. Adding to the chaos and attacks on Twitter, once it was determined the shooter was a female, CNN decided it would be a good time to "speculate" as to whether it was some type of "love triangle," which had Twitter users passing that along as if it was actual reporting. CNN is being roundly criticized for that, but not just for using the outlet for speculation, but many were incited to anger because they thought it was "sexist" of them. 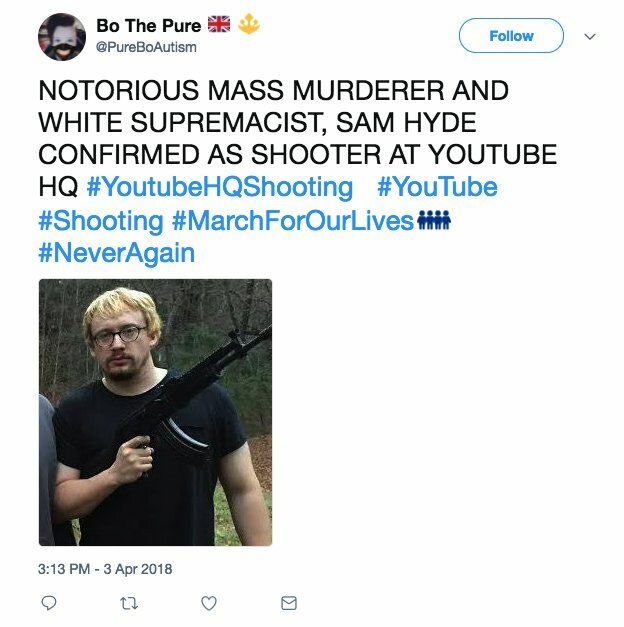 No tragedy turns social media into complete choas without a little help from the hoaxsters at 4chan, who once again immediately claimed the shooter was comedian, "white supremacist" Sam Hyde, the same person they tried to trick people into believing was responsible in February for the Parkland shooting. Of course 4chan and other trolls and hoaxsters didn't only use Hyde, but a number of other people that had nothing to do with the shooting, both male and female, with one poor guy saying "Sigh. Here we go. 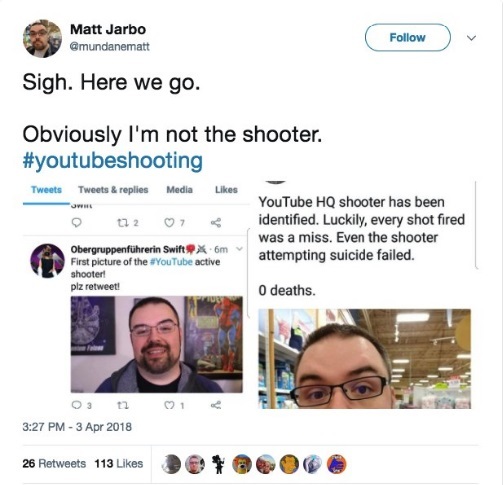 Obviously I'm not the shooter," after his picture was plastered all over Twitter with claims that his face was that of the shooter. 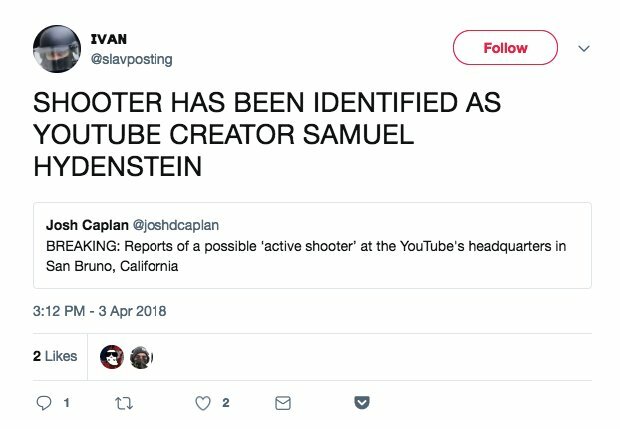 There were dozens of other hoaxes being spread on Twitter on Tuesday, all can be found on BuzzFeed's Jane Lytvynenko thread as she attempted to keep track of them all as it was happening. From gun grabbers to hoaxes, the craziness seen on social media during and after tragic events shows how hard it can be to get accurate information during these type of events, with even the MSM contributing to the chaos and "fake news" by speculating when they should be reporting. While the hoaxtsers are an annoyance and the MSM, like CNN's speculative "love triangle" BS, just gives the 77 percent of Americans that believe the MSM reports "fake news" more reason to believe that, it is the crazy gun grabbers that are the most dangerous, because they have stopped claiming they aren't coming for our guns, and are actively pushing to repeal the second Amendment and to ban any weapon they think looks "scary." The attacks on the NRA are because it is the most well known and well funded gun rights group, but make no mistake, they will go after them all, and they are already coming after ever law abiding, legal gun owner in America. While Nasim's social media presences is being scrubbed by Instagram, and YouTube and her site unreachable, there are some reuploading her videos in order for people to see and hear her for themselves. As seen below, she does seem like she was a few cards short of a full deck. Note- If YouTube deletes the following video, we have saved it and will attempt to upload it over at d.tube.